The first thing you're going to notice about this series is that it looks like something that should've been published eighteen years ago. The writing, the artwork, even the cast, has been ripped directly from the pages of DC's early '90s Death of Superman / Rise of the Supermen storyline. The style hasn't aged particularly well, but I guess it's been MIA for long enough to be considered retro, and lord knows why, but that's a trend that always seems to be in vogue with our culture. We just can't get enough of looking, acting and speaking like the past, and Booster Gold #29 is the comic book equivalent of that trend. Of course, the nostalgia factor is a heavy trip for anyone who was reading back then, but the memories aren't always happy ones. The medium has evolved significantly since Dan Jurgens was in his prime, and though his Death of Superman was in some ways the grandfather of the more mature, intelligent slant the industry (and DC in particular) has adopted since then, it's also just as much a product of the sensationalist, prospector-friendly era that nearly killed the market for good. It's a dash of the good, a pinch of the bad as far as these memories go. Thing is, upon closer inspection the throwback theme is more than just a cheap gimmick. 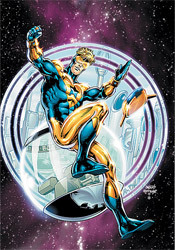 In his latest role, Booster Gold has taken on the title of history's defender, a job description that sees him more often than not protecting a character he absolutely despises. This issue is a perfect example: shot back in time to the days when the Cyborg Superman was not only free, but genuinely considered as a replacement for the real thing, Booster has to ensure the maniac follows through on his terrifying destruction of Coast City. It's an odd thing for a hero to be working behind the scenes to see genocide through to its conclusion, but Booster's boss – and his conscience – have ensured him that the greater good of the ramifications from that moment outweigh the sacrifices made by its victims. Adding to the ordeal is the presence of another traveler, Sondra Crain, who moves through time with the more noble, perhaps naïve, goal of averting the crisis altogether. Jurgens doesn't expressly endorse one point of view over the other, but he also doesn't explore the conundrum quite as thoroughly as he probably should have. Subtlety and nuance are not two of Jurgens's stronger suits, and his stiff, straightforward storytelling style (say that ten times fast) often works to the book's detriment. Booster Gold, in its present form, is as hot and cold as they come. Under the surface, the concept of adding depth and perspective to several of the publisher's most memorable stories is wonderful. The choice of Dan Jurgens as writer / artist works well to set the tone of the era and immediately send more familiar readers on a quick trip down the aisles of their memory banks. Problem is, his writing can't keep pace with the high concepts and his artwork never delivers the wink or nod to the present that could tie the whole bag together. An early '90s style would've been perfectly appropriate in cases when the story was set in that period, but it's totally out of place when the scene changes to the modern day or the future. It's a fine idea that I could've really got behind, but in its current iteration I can't say it's working. Flip through it for the nostalgia, but leave it on the shelves near the back issues it's repurposing.